Times App for iOS and Android, readers can walk around a truck in the village of San Miguel Los Loes, which is buried in its ashes up to its windows. 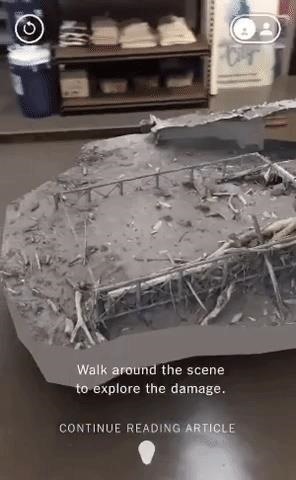 The 3D scene can be switched between tabletop model and life-size scale. "My colleagues and I recognized an opportunity to explore the extent of this natural disaster in a new way to convey to our readers the story by putting them on the ground and allowing them to examine them as if they were there, " Times reporter Niko Koppel said in a Times Insider report. The experience was captured by 727 photos taken by photographer and Guatemala resident Daniele Volpe on June 8, five days after the outbreak, in 29 minutes. We taught Mr. Volpe locally how to photograph for photogrammetry, capture the scene from every angle, and later apply software that combines his hundreds of images into an accurate 3D model, "says Koppel. 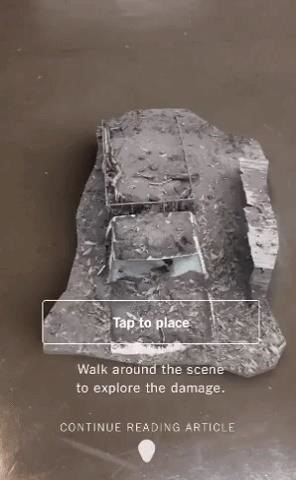 The story and its AR experience were released on June 19 or 16 days after the outbreak, while the experience gives readers a perspective on the damage left by the volcano, which killed more than 150 people and still misses nearly 200 Reporting highlights the fact that Augmented Reality is still not a tool that works well for the B Reporting of news is appropriate. In a world where news breaks in seconds through tweets, not hours on television or days in newspapers, two weeks are simply not fast enough. Until Moore's Law completes enough cycles, we reach the point where photogrammetry becomes so frequent. A Selfie of Snapchat Lens, Augmented Reality is published in the traditional monthly magazines. With only five AR stories being published in the Times in six months, this is clearly the case.